Why did you pick Uzbekistan as a place to visit? Isn’t it a dangerous place? As regards the second part of your question, which part of the world is not dangerous? Or safe, for that matter. Isn’t danger or safety subjective? Perception of safety and danger depends on the person concerned. The West, which is perceived to be a safe place, scares me more than places that most people are advised not to travel to. All I can say is that if you are comfortable travelling to a place, do so. It’s a personal choice and Uzbekistan certainly was mine. Did you travel solo or in a group? Is it safe to travel solo? When I started planning the trip in November 2014, it was meant to be a solo trip. Some of my friends expressed interest in joining me, when I mentioned it to them. At one point, we were supposed to be a group of four travelling to Uzbekistan. But then one friend dropped out and then another, leaving behind two of us. Later, one of the ‘drop-outs’ re-joined, only to cancel 10 days before the trip. In the end, it was just two of us who travelled to Uzbekistan. You’ve read my account and you can now read another perspective of that trip here. I found Uzbekistan to be very safe and comfortable. Even though I wasn’t travelling solo, I met other solo travellers from other countries and all of them said that they felt perfectly safe in Uzbekistan. 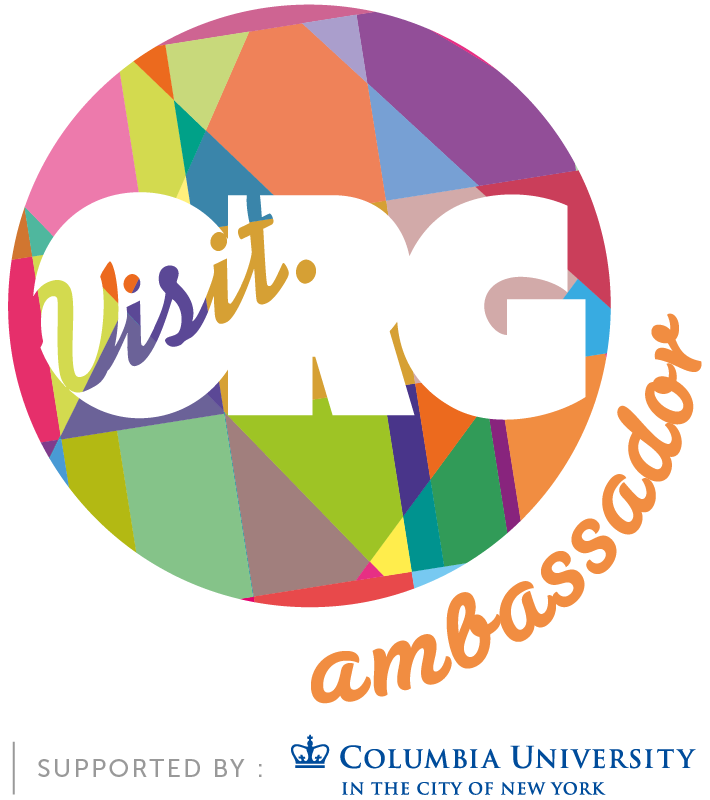 How did you do the groundwork and planning for your Uzbekistan trip? How did you decide on the cities to visit? A preliminary search led me to a very exciting art and crafts tour of Uzbekistan that seemed tailor-made for me. But when I saw the tour cost, I dropped the idea and decided to do the trip on my own. I first came up with a basic plan of a week-long trip visiting the major cities of Bukhara, Samarqand and Tashkent. It was at this point that I started looking at budgets and logistics, and found that I could add more days and more destinations to my trip. I read many Uzbekistan itineraries available online and created one that suited my interests, the flight timings and dates, and my budget. It took a while to finalise the trip itinerary and I kept adding or removing details or tweaking it till I was satisfied. My flight and hotel tickets were booked by May 2015 and thereafter it was countdown time for the visa application and then the trip itself. What was your itinerary like? Is there anything that you would have done differently? My trip dates were from September 16 to 28, 2015, and the rough itinerary is given below. If you’d like the detailed itinerary, please leave a comment and I’ll mail it to you. Though I was very happy with my itinerary, there is one thing I would have done differently — instead of exploring the forts and dakhma of Khorezm en route to Khiva from Nukus and tiring myself out, I would have spent an extra day at Khiva and explored them from there. This option would have also given me time to visit Dishon Kala, another fortified place in Khiva. Did you do all your bookings on your own or did you use a travel agent in India or Uzbekistan? I had intended to do all the bookings myself till I hit a block — airline tickets. Even though I knew that Uzbek Air flew direct from New Delhi, I could not find them on any booking portal or booking options on their site. That is when I decided to use the services of a travel agent. My friend Jayanti of One Life to Travel connected me with Noida-based Sudip Sen of Incredible Journeys and he helped me with all bookings, including internal travel in Uzbekistan, hotels, guides and flight tickets. Sudip also handled the visa formalities. What is the Uzbekistan visa process like? Is it complicated? As I mentioned earlier, visa was handled by my travel agent and I faced no hassles. 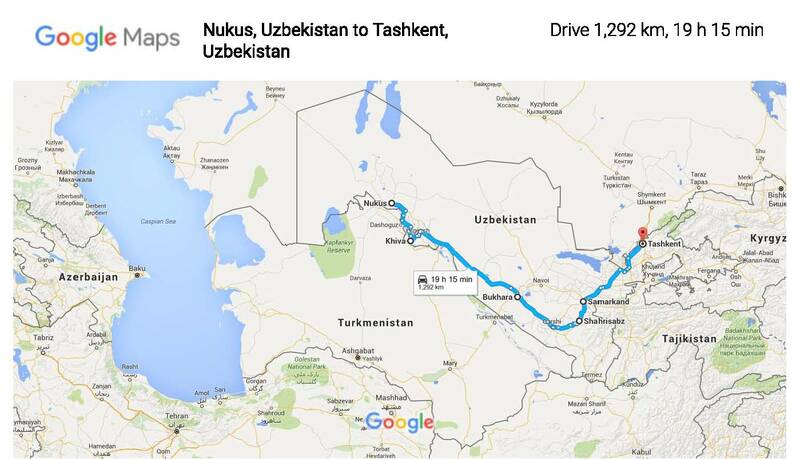 Are there direct flights to Uzbekistan from India? What was your customs and immigration experience like? Yes, there is. Uzbek Air flies direct from Delhi to Tashkent. They keep changing their timings, so please check their schedule. Customs and immigration was smooth. No questions were asked and the customs declaration form was scrutinised carefully before being stamped. It took longer for the baggage to arrive at Tashkent airport than for me to clear immigration! What is the local currency? How did you handle money transactions — did you carry money with you or did you use a credit/debit card? I didn’t use any ATM and exchanged 100 USD for local currency as and when I needed to. I was told that ATMs or credit cards were not very reliable, so preferred to do it this way and it worked well for me. How did you travel within Uzbekistan? Did you use public transport? Sudip had arranged for a transfer from the International to the Domestic Airport at Tashkent, from where we took a flight to Nukus for the first leg of our trip. Thereafter, it was a road trip with a car and driver from Nukus to Samarqand. That car and driver was with us till we boarded the bullet train at Samarqand for Tashkent. We had the services of a local car and driver in Tashkent for the first day and then only for the transfer from our hotel to the airport on the second day. Though all the cities I visited had buses or shared taxis as a form of public transport, I didn’t have the need to use them. Either I had the car or the monuments were within walking distance from where I was staying. The only time I used public transport was the Metro at Tashkent, which is cheap, clean and fast. Where did you stay like in Uzbekistan? How did you zero in on the places you ultimately chose? What was your experience like in each place? Jipek Joli, Nukus: This was my first hotel stay in Uzbekistan and I really liked it. Friendly staff, comfortable rooms, vegetarian options, and a chef who sang Hindi songs. 🙂 Recommended. Malika Kheivak, Khiva: Centrally located inside the Itchan Kala and within walking distance of everything inside the fortress. My room had a view of the Islam Khodja minaret and each time I saw it, I had to pinch myself that it was real! Recommended. Rustam and Zukhra, Bukhara: This B&B is situated right next to Lyabi Hauz and many of Bukhara’s sights are within walking distance. I loved the great big breakfast spreads that were served here and have been spoiled for life. Recommended. Jahongir B&B, Samarqand: This charming B&B is located just five minutes from the Registan and is within walking distance to other major sights in the city. My room, which was furnished with traditional furnishings, was very comfortable. It also had the advantage of stepping into the common balcony and eating grapes straight off the vine. 🙂 Recommended. Hotel Atlas, Tashkent: This was the only hotel in Uzbekistan that I didn’t like for they goofed up my bookings, breakfast was pretty sad, and it was generally a cold and sterile place. Not recommended. What about food? Are vegetarian or vegan food available? What are your recommendations for places to eat? Though Uzbekistan is a meat-eater’s paradise, both vegetarian and vegan food are available, though the choices for the latter type may be limited. The best thing about the food in Uzbekistan is the emphasis on seasonal produce. 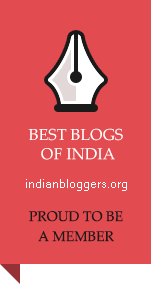 I have written a detailed post on the food and markets scene and recommend that you read it. Bukahra: I ate at the hotel and at Cafe Badruddin near Lyabi Hauz. Avoid the open air restaurants at Lyabi Hauz; they are overpriced. Where would you recommend that I begin my exploration of Uzbekistan from? What are the must see things? Though you will fly in and out of Tashkent, your trip will depend a lot on when your flight arrives. Having said that, I must confess that my Nukus → Khiva → Bukhara → Shakhrisabz → Samarqand → Tashkent order worked well for I travelled through history and time from the oldest (Nukus) to the contemporary (Tashkent). As for the must-sees, it is very difficult to choose, for all the places I visited are must-sees. The only thing I will say is if you are not a huge fan of museums and Avant Garde art, like me, there is no reason to visit Nukus. Instead, spend an extra day in Khiva and explore the forts of Khorezm from there. I have heard that Uzbekistan is a shopper’s paradise? Is it true? 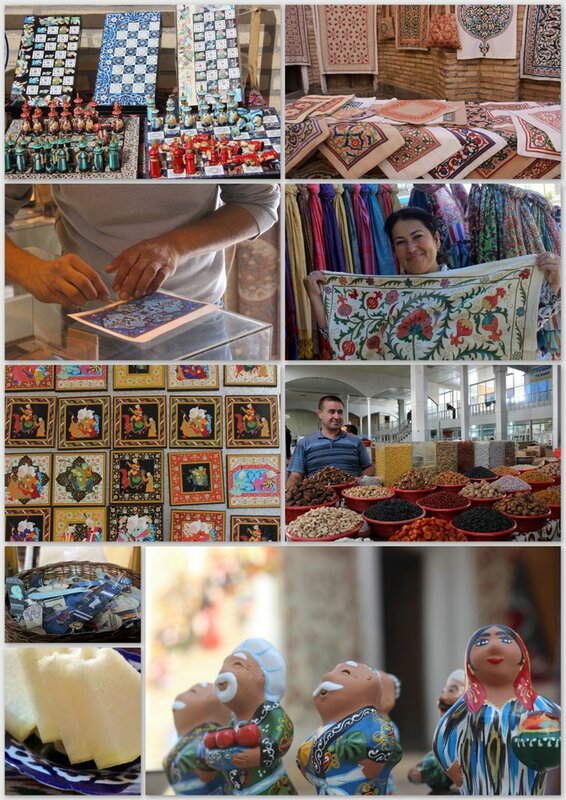 Can you share what you brought back from Uzbekistan, if any? From your posts and photographs, Uzbekistan seems like a beautiful place. But I’m not sure I can see spend time only seeing monuments. Are there other attractions in the region? To be honest, I did not check out for anything other than history and culture. But with a country that has so much to offer, I’m sure there will be other non-monument options available for someone like you. I do know that there are arts and crafts tours to Uzbekistan, as well as hiking trails. Was this a sponsored trip? No, this was NOT a sponsored trip in part or in full. Why didn’t you think of combining Uzbekistan with one or two of the nearby countries? That is exactly the question my mother asked ! I have never been a fan of ticking places or countries off an imaginary or real list, so there was no question of a country hop — it would have been too hectic. There are people who do so, but it doesn’t work for me. I do plan to visit the region again in a couple of years (fingers crossed) and explore the parts of Uzbekistan that I haven’t visited yet and maybe, just maybe, combine it with a neighbouring country like Tajikistan or Kyrgystan. Any other tips and suggestions for Uzbekistan? Attire: Dress codes vary throughout Uzbekistan, though Western-style clothes are acceptable in Tashkent and in large cities like Samarqand, which see a lot of tourist traffic. However, do dress modestly, covering arms and legs, when entering a holy site. Do remove your shoes when entering a house or a holy site. Entry Fees: Museum entry and camera fees are pretty steep, so please keep that in mind when budgeting for a trip to Uzbekistan. Personal Safety: I found Uzbekistan to be a very safe place, but I would still request you to take all possible measures to ensure your personal safety. If you’d like to travel in a small group, you could consider joining One Life to Travel; they are organising a trip in October 2016. So this was my Uzbekistan trip planner, and I hope that you find this useful. If you think, I have missed out on something, then do let me know in the comments section and I’ll address it. Join me on Twitter, Facebook and Instagram as I share and all “My Favourite Things” with you. Thank you very much. Hope you found it useful. Very informative Sudha..isn’t it incredible that your posts have inspired others to make similar trips to Uzbekistan! Thank you, Kat. Uzbekistan is such a fabulous place that I’m afraid I can’t take all the credit for inspiring people to travel there. I love the honesty and simplicity with which you have shared all the information about Uzbekistan. Thank you. I am taking your planning tips for a trip. It can be applied to other trips as well. Lovely and I wish to travel to Uzbekistan too. I can only imagine how the blue tiles will look in real. That’s good to hear, Lata. All of us have a method to the way we plan anything, including travel. I guess, this is mine. And yes, like you pointed out the tips can be used or modified for any trip. Lovely post! I’m definitely going to visit Uz after reading your post. This is just such an amazing post. I have solo backpacked in Turkey, Georgia and China among the silk route countries…but Uzbekistan has still not not happened…Your post is very inspiring. Welcome here, Priyanka. Thank you so much for stopping by and commenting. I hopr that you are able to visit Uzbekistan one day. Good luck and cheers ! Excellent post! I’m visiting Tajikistan next year 2017 and this post has made me even more excited! Thank you for writing it! Thanks. But this post is about Uzbekistan and I hope you do realise that Uzbekistan and Tajikistan are two different countries. You have not mentioned the total cost of the trip other than the airline tickets . Please give a rough idea. Hello Preeti, it has been more than two years since I visited Uzbekistan and there is no point in mentioning the cost now as it would not be the same now. I spent around Rs.1.5 lakhs; it will definitely be different now. I read your trip review in 2016 and have kept is close by for a much wanted trip in the future. Am now planning a trip to Uzbekistan next year and would appreciate if you would send me a copy of your detailed planner that you mentioned in the article. I am planning to follow mostly in your footsteps but fly into Urgench and miss Nukus. Any further tips would be great.